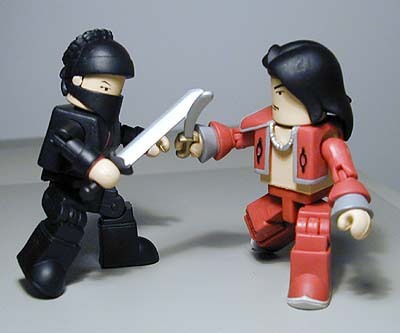 Kevin Apgar is back with another great guest review of more MiniMates - take it away, Kevin! Suffice it to say that Art Asylum is license happy these days. I recently reviewed Iron Maiden’s Powerslave from the MiniMates Rock Line 1. This review is turning a bit more Kung Fu with a review of two out of four of the characters from the first run of the Crouching Tiger, Hidden Dragon line… Jen Yu and Lo. Much like the Rock Line, the CTHD minifigs come contained within a fairly sturdy carded bubble. 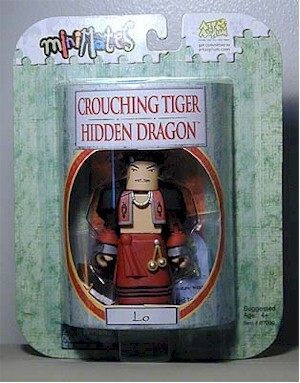 The insert card says Crouching Tiger, Hidden Dragon and has the character name at the bottom of the viewing window. Again, because it is sealed on there, it is highly collector unfriendly. The back of the card shows all four of the characters from series 1 which also includes Li Mu Bai and Yu Shu Lien. It also lists the figures that are coming in series 2. Unfortunately, I ditched the card and forgot to mark down who they are going to be. My bad. I’m taking off one and a half stars here because the box doesn’t give any sort of history of the characters or talk about the movie in any way, shape, or form. It doesn’t even list the actor’s names. As I’ve said before, I like to learn a little bit when I look at boxes. Plus, you have to tear the stupid thing apart to get to the goods. Much like the Rock Line, these figures go above and beyond in terms of sculpting. 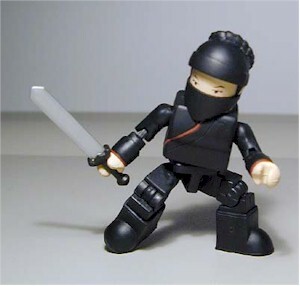 The outfits are not just simply painted on a flat plastic body. They have slip-over elements to their outfits. 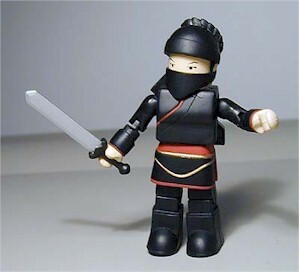 Jen’s ninja outfit actually slips over her head and has all the proper female anatomical “accoutrements.” Her mask also slips over her head and locks in place using a relatively solid pin-and-hole system. The mold on the mask is quite nice and even has painted-on ears (although they are quite sloppy). She also has a long skirt that slips on the peg that holds her upper torso to her lower torso. Lo comes with a very nicely molded open-chested jacket with a single right should cover and a necklace that spans the open area of the jacket. He also comes with a black over-the-shoulder cape/cloak and a long skirt that fits on the same way as Jen’s does. The cuffs at the end of the sleeves of his jacket flare out nicely as well. The kicker is the detail in his boots which have the same upward-flaring tips that he wore in the movie (think Arabian Nights-style sandals). He also has his long, flowing black hair with a red headband adorned with a little silver medallion in the middle. Very nicely done, Art Asylum! However, the hair does not stay on his head that well. The peg is a little too small for the hole, so be careful. Jen’s paint job is fairly simple… she’s black with some red highlights. Then there is her skintone, of course. No wash on either of them whatsoever. Lo’s outfit is a nice reddish shade with gray trim along the edges. His jacket has black ornamentation on it and his shoes even have soles that are painted gray to stand out from the red. Plus, the headband and medallion molded into his hair are such a nice touch. His skirt has three black bands around the bottom edge and two light colored bolo-type ties with silver highlights that are actually a separate piece of plastic and not part of the skirt mold. They even remembered to give Lo his Humphrey Bogart looking mustache. 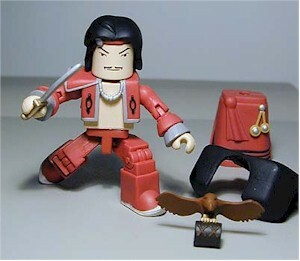 Here is where we see the primary difference between the Powerslave figure and the CTHD minifigs. Whereas Powerslave had bupkus, Jen has her sword and a sheath that snaps on her back (even though it is very loose) that actually holds the sword. In this case, I will count her skirt as an accessory because I have removed it and the figure does look fine without it, if not a bit better. Jen’s score would have been a bit higher had she come with a hairpiece that could be put on should you choose to take off her mask. Perhaps a maskless Jen will be included in series 2? 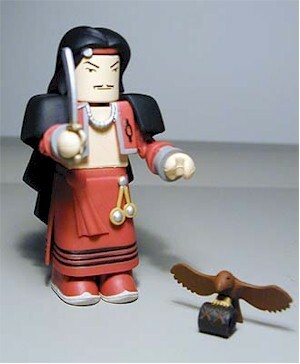 Lo comes with a scimitar-style sword (but no sheath), his cloak, his skirt, and his bird. Wow. That’s all I can say. Much like Powerslave, the CTHD figures have 12 points of articulation: a ball-jointed head which is limited to spinning due to the clothing sculpts, ball-jointed shoulders, hinged elbows, cut wrists, cut waist, ball-jointed hips, and hinged knees. However, the joints in the hips and knees are useless when the characters are wearing their molded skirts. So, if you want to have any fun with these characters whatsoever, you must take the skirts off. These minifigs run the same price as all the other MiniMates, or so they should. I cannot guarantee that claim from one store to the next, so… caveat emptor. I feel these two were far more worthy of the money I paid simply because of the accessories they come with. Plus, you can make them fight. I love ‘em. That’s all there is to it. Not only are they very well sculpted and accessorized, but they are so well articulated that you will have no problem re-enacting scenes from the movie with them. I think I’m gonna have to keep collecting these MiniMates. Who needs Kubricks? I sound like a walking advertisement, don’t I? Sorry. Figure from the collection of Kevin Apgar.